JUPITER, FL – Oct. 10, 2018 – Scripps Research scientists have uncovered the workings of a critical process in cell survival. Their study, published recently in the Proceedings of the National Academy of Sciences, is the first to show exactly how a protein called talin activates another critical protein, called integrin, to do its job on the cell membrane. 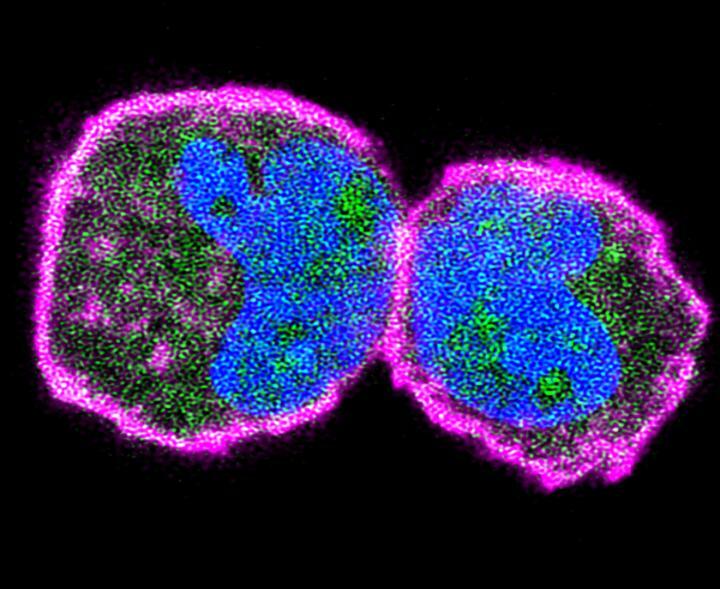 While the researchers focused on basic cell biology, the findings suggest targeting a protein like talin to interfere with this activation process, giving scientists a potential way to tackle cancer cells. The research was led by the laboratory of Tina Izard, PhD, professor on Scripps Research's Florida campus. The laboratory focuses on understanding the structures and functions of proteins involved in a process called cell adhesion. Without these proteins, cells could not send signals or react to the surrounding environment–cells simply could not function effectively. A key protein cell adhesion is protein integrin, which is involved in certain cancers and even bleeding disorders. "Integrin activation is a fundamental process in cell biology that also goes awry in important pathological states," says Izard. "Integrins play key roles in cancer progression and metastasis where certain tumor types exhibit higher levels of certain integrins." One long-standing mystery in the field of cell adhesion was the question of how talin, a protein that interacts with integrin and makes cell adhesion possible, is activated. Researcher Rangarajan Erumbi, PhD, staff scientist at Scripps Research and co-author of the study, says past studies have suggested that talin interacts with the cell membrane to activate integrin, although the detailed molecular mechanisms were unknown. Erumbi says it is especially important to understand talin's role because talin "glues" integrin to the cytoskeleton within the cells. "By gluing together multiple players, talin brings stability to the cell and helps with functions like cell migration and differentiation." To answer the question of integrin activation, the researchers had to overcome technical hurdles that had previously blocked scientists from seeing how proteins bind the cell membrane. After many years of trial and error, the researchers crystallized the domain of talin that interacts with the cell membrane, letting them map out its structure in high resolution using x-ray crystallography. Their structure reveals how talin binds to the cell membrane to activate integrin. Inside the cell, talin exists in a non-activated state defined by interaction between the two ends of talin, its "head domain" and its "tail domain." By combining several techniques, the scientists could show that the lipid activates talin by severing this head-tail interaction and exposing a region of talin that binds to integrin. At last, the researchers have defined the molecular basis of the cell membrane in integrin activation. Erumbi believes this closer look at talin could also open the door to future cancer therapies that could target the talin-membrane interaction to stop tumor growth. Although some experimental tumor therapies target integrin on the cell membrane, a potential issue with these therapies is that drugs tend to target the region external to the cell membrane. This means talin could be a better target in tumor cells to weaken adhesion and cell integrity at the same time. "We now understand this aspect of lipid biology, which lays the foundation for the development of novel integrin therapeutic agents," Erumbi says. Krishna Chinthalapudi is first author of the study, "The interaction of talin with the cell membrane is essential for integrin activation and focal adhesion formation." The laboratory is supported by the National Institutes of Health (GM 094483), the Department of Defense (W81WH-18-100451), and the State of Florida on related membrane binding proteins.